Sam Crawley's Little Box on the Web: The Greens Cause Climate Change? Fascinating article on The Register covering the latest NASA research on Climate Change. 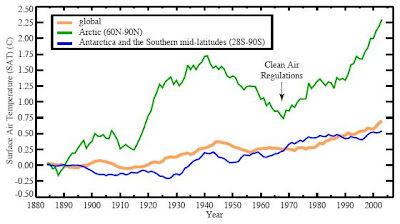 It would appear that clean air regulations in place since the 70s, designed to reduce the levels of particulates in the air, rather than the CO2 emissions which are the subject of so much discussion currently, are responsible for the rise in global temperatures over the past decade, and the subsequent melting of the ice caps. What do we learn from this? Merely that we don't have all the answers, the environment is a complex system that we are far from understanding, and that some of the green lobbies need to be less smug about their claims and demands. The new research suggests that the Arctic warming trend seen in recent decades has indeed resulted from human activities - i.e the laws introduced to improve air quality and fight acid rain. 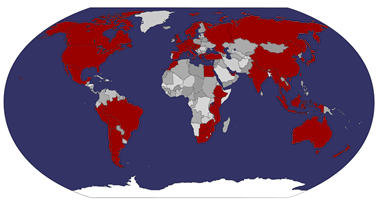 Specifically the sulphates that come from burning oil and coal, particularly in the industrialised Northern Hemisphere which also has less precipitation to wash the air clean, which previously would scatter solar radiation, are down by 50% or more as a result of European and US regulations.